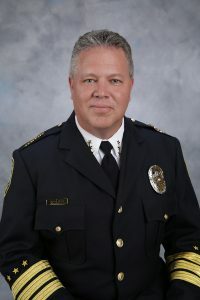 Steve Mylett was sworn in as Bellevue’s Chief of Police in April 2015 after an extensive national search. Chief Mylett joined the Bellevue Police Department from Texas, where he led the Southlake Police Department from 2011 until early 2015, following 23 years with the Corpus Christi Police Department. During Chief Mylett’s tenure at Southlake, property crimes decreased by 30 percent. At Corpus Christi, Chief Mylett rose through the ranks, from cadet to assistant chief. He served in various divisions and assignments, including the Patrol, Special Services (Narcotics), Community Services, and Administration Divisions. Before joining the Corpus Christi force, Chief Mylett served in the Air Force as a security police officer for six years. Chief Mylett earned a bachelor’s degree in applied arts and sciences from Midwestern State University and a Master of Science degree in criminal justice leadership and management from Sam Houston State University. He is also a graduate of professional development courses including senior management in policing (Police Executive Forum) and Bill Blackwood Leadership Command College. https://www.bellevuewa.gov/police.htm - Bellevue, WA Police Department website. NOTE: they are hiring and ask everyone to consider applying and to tell their friends to check out these career opportunities. Contact Bellevue Police Chief Steve Mylett by email, smylett@bellevuewa.gov, and his direct telephone at 425-452-4334. Bellevue Police Chief Steve Mylett, who you can contact directly at smylett@bellevuewa.gov and 425-452-4334, shared the challenges, opportunities and plans for building the city’s Police department of the future. I highly recommend quickly visiting the Bellevue Police Department website right now, before your forget, to discover important and useful resources and information for you and our community. Bellevue Police Department is hiring (entry level, experienced and volunteer positions) with starting salaries between $59,536 and $77,405 depending upon experience. Click here for details and tell your friends to visit www.bellevuewa.gov/police-employment.htm to get more information and apply. How to contact your Bellevue Police Captain : Did you know the City of Bellevue has mapped out North, West and South Sectors, and each one has a dedicated Police Captain who manages Police resources and can call in other city, state and government department resources whenever needed to resolve a situation. Check out this map to see which sector you live in, and click here for all Police contact information. BBRC’s Steven Lingenbrink is our Rotary district’s 53rd representative at the 2016 Council on Legislation. He is one of 530 Rotary representatives, one from each district in the world, will meet in Chicago, IL from April 10-15 2016 to discuss and vote on 181 proposed enactments and resolutions. If you have any comments for Steven, please email or call him with your input. Paul Osborne shared that BBRC’s goal of 100% member participation in the Rotarians Pledge to End Malaria, which would most importantly help raise awareness and action to end Malaria. BBRC members were all asked to donate $2 to pay for and wear a pin to help raise awareness. Impressively, BBRC had 100% participation and exceeded succeeded in 100% participation, while raising which would raise at least $3,500. The key goal we achieved was 100% participation to send a clear message of BBRC’s united commitment to ending Malaria. Fun facts: BBRC has 97 members were all asked to pledge $2 for the pin, and 100% participated; the generosity of members surpassed the $194 the pins would have raised and contributed more than $3,500 AND the BBRC will match this for a total donation of $7,000. Rotary First Harvest meets tomorrow, April 9th. Paul band playing at district conference end of April 29-May 1 in Coordelaine, Idaho. We need to listen and start a dialogue about building our relationship with our Police profession with society. He has been in serving as Bellevue Chief of Police for one year. He is now working at reorganizing the department to make it less top heavy and even more engaged with the community with more streamlined communications. April’s Third Thursday will be held at Azteca on 112th. It seems to be a popular venue with plenty of parking and SNACKS!! We will be looking for fun new places with outdoor seating to celebrate the sunshine for our summer get-t0gethers. So if you have a favorite place, please let Carmela know. For this month, our Happy Hour will shin-dig will begin about 4:30 – or whenever YOU get there. There is no party without YOU! Chapman's Car and Shuttle Service Available! Procrastinators BEWARE!! The Conference Hotel is BOOKED!! But take heart, our gracious President Paul Chapman offered his car for the night. If you prefer a real bed, there are several other hotels in beautiful Coeur D’Alene and SHUTTLE SERVICE to and from the conference. Don’t Delay! Register for District Conference Today!! 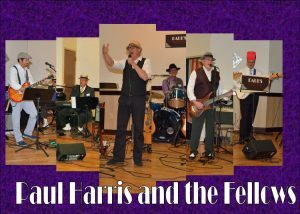 Grab Your Tickets and See Paul Harris and His Fellows LIVE! !